Garrett has the kind of sense of humor and inimitable personality that makes mothers everywhere swoon. He’s the kind of spirit who might even not drink all of the almond milk from the box or leave one solitary pork rind in an entire bag. Or run through the house in underwear the dog’s chewed holes in. Or play his thrash metal guitar too loud. But enough about my kids. When Garrett shared his incredible success on our Facebook Group page, it was pretty exciting to (1) see a guy actually brave enough to post to a site largely comprised of hot chicks (like myself) (*cough sputter* OK like you) and sound his barbaric yawps about his pretty spectacular weight loss success, and (2) see someone so young already making positive life choices, especially while attending college, the home of all night study sessions, booze and fast food. Thanks again for all of your support, tips, recipes, and just plain hilarity. 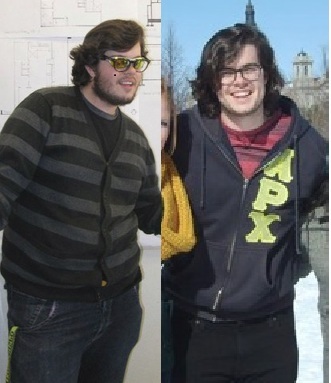 It really kept me motivated and glad I chose low carb. See? Mother swoon. Yes, Garrett, you can borrow the car. Why I started: Rather than gaining the “freshman 15,” I gained the “freshman 30” and then some “sophomore 20” and a little bit of “junior 10.” I went from easily fitting into a size 36 or 38 pants to barely even fitting into a size 40 “relaxed-fit” pants. Before I started I calculated my BMI and I was considered “Severely Overweight.” That totally freaked me out, and I knew I had to do something. I recently bought a pair of size 38 “slim fit” dress pants from Calvin Klein. Now that freaked me out, but in a good way! Diet Plan: I guess you could say Atkins. Started off with the typical induction, and did that for 3 1/2 weeks instead of two. Slowly added in more higher carb stuff like nuts, cottage cheese and all that good stuff. I try to make it to the gym when I have the time, but most of the weight loss is from low carbing. Favorite Low carb food: Chorizo and eggs! With some sour cream on top of course! Granted, I’m also a cottage cheese addict. What’s next? Hopefully I can get down to below 200lbs, but I’m very very happy at where I’m at today. Funny story: My roommate and I are both on a weight loss plan. Me: Low Carb; She: Veganism. She tells me I’m clogging my arteries as I eat my bacon-wrapped steak. I tell her that those vegan-friendly pretzels she’s eating turn into pure sugar when they hit her blood stream. To each his own, I suppose. I love reading Garrett’s experiences and so appreciate his taking the time to share his inspirational (and humorous) journey. Education takes you a long way in life, but a sense of humor will carry you through every time. Anyone who can crack me up in an email is the kind of person you want around when the chorizo eggs burn and your dog runs away with the bacon. Are you a dude? Dudette? Do you have a similar story? Whether you’ve overcome a health problem, a weight problem or just life’s problems with your healthy lifestyle, would you like to share your experience with Your Lighter side and reach thousands? If so, be sure to email me at YourLighterSide at gmail dot com! Awesome showcasing of a great cutie guy! Congrats, Garrett – looking good! It's nice to see other people sticking to the low carb thing and losing weight. I completely relate to the low carb/vegan dichotomy. Sometimes I think I chose low carb just to show up all my friends that recently became vegan or vegetarian, and guess what, I'm losing and they're not! Thanks for the motivation. Garrett,,I am so happy for you… keep it up.. and you will get below that 200 mark.. bet on it..
the whole key to low carbing is. ..to keep on keepin' on… do not let others knock you off coarse.. You have done super… way to go ..
To get below his 200 lb mark, he should totally check out the primal blueprint. So many success stories just like his, very similar to the food he's eating now. It's wonderful. So happy to found you. I am Katia from Greece and I am overweighted (obesity). I started on January 15 with Atkins at 160 kg and now I am 148. Most of the people I know, have lost two many kilos, even that they are less weighted than me. I think I do something wrong. I am trying to find a specific diet plan for induction but I can't. Your recipes are great. I have another recipe and I will send it to you if you like, it is for a lowcarb "bread" with tahini. He looks so great! Congrats congrats!!! I LOVE seeing others succeed and reach their goals, thanks for sharing his story!